Usually the curbyou are doing 10-15 cm above the leaf carpet. Material for their production can serve as concrete, wood, paving slabs, natural stone, brick, curb blocks, etc. Nice garden path, framed by red brick set at the corner. Usually curbs are laid in a concrete base. It buried part of the height equals the height of the aerial part. Setting the border is to garden paths. Dig a trench along the intended track to a depth equal to half the height of curbs. Prepare the cement slurry. Set the level so that all the stones were set at the same height. Pour the solution into the trench, install curbs, leave it to harden for a day. Pour the curb with the soil and start laying garden paths. For long-term use of the garden path border should be set higher than its level, to sand and soil falling on the belt. The base of the curb can be arranged from sand and gravel - then improves the drainage of the entire track. There are also plastic bordersthat you can buy in gardening shops. Used for the manufacture of plastic high density. 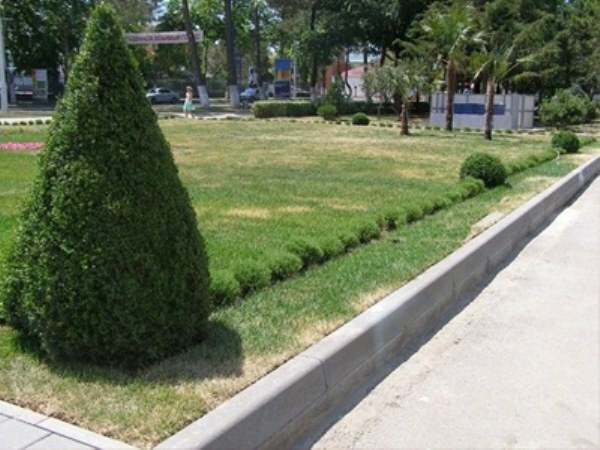 It is simple to install and can be easily seen on the plot so that it can perform the function of a delimiter of the flower beds, mark the terrain and the border of Vicosa grass. Some types of plastic curbs are used for laying paving slabs. It is easy to install and requires no digging of trenches and the preparation of cement substrates. This type of fence can be installed in fluid lines by using the anchor pins. Plastic curb can withstand significant physical activity and lowering the temperature to -40oC. Low fencing paintings garden path or sidewalk used to prevent breaking or washout of the edges and also to make the construction of greater strength, called curb. The most common material for the manufacture of the curb concrete. The installation of such stone requires no special skills, enough to have experience with solution and the appropriate tool. First, you must choose the most suitable stone; the border may be large (road) or small (sidewalk). In the first case, the onboard stone is designed for functional load: the division of sidewalk and roadway. The second option is intended to give the plot the path of the visual integrity and aesthetic appeal. If you want to use a border as a separator of the carriageway and footpaths, it is preferable to buy the stone, made by vibrocompression. Such products are more reliable and durable, having high resistance to mechanical damage. Also, when choosing a stone, pay attention to its hue: in the production process it is possible to add various dyes, which color the border in the specified color. Colour match paving and a border will give a finished look of your carpet. The initial phase is to prepare the surface where you will reside for the curb. Hammer in the ground stakes and stretch twine between them so that it ran along the line of the future curb. Then dig this line a trench 20 cm wide (paving stone) or 30-40 (road stone). The depth should be equal to the height of the curb. The finished trench should be compacted, for this you can use a homemade tamper, shaped like an inverted letter "T". Next, pour a layer of gravel (about 5 cm) and sand layer (layer thickness depends on the height of the kerbstone - he needs to go outside by about 2/3. Laid on the sand must be well compacted. The next step is preparation of the solution. To do this, use a concrete mixer or a suitable container. The mixture includes 1 part cement, 2.5 parts sand and 2 parts fine aggregate (klinets). The amount of water depends on the moisture content of the sand. 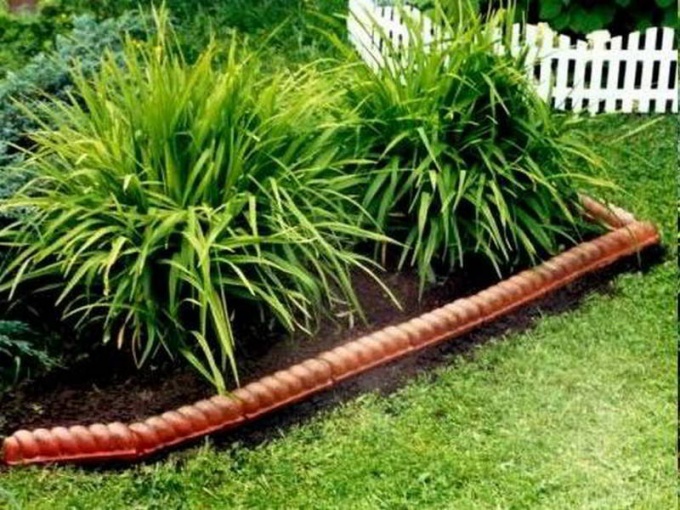 When everything is ready, you can put the solution into the trench and install the curb. Here, it is desirable to use a rubber mallet, which you can use to adjust the height of the stone, degree of immersion in the solution. Setting curb, simultaneously apply the mixture on the joints between the stones. Making sure once again that the stones are aligned, complete the solution of the remaining voids. At the finishing stage, you need to fill cracks between stones with a mixture of dry cement and sand; pour water on them and leave to dry.